Download 1 Asset at a time from the Search Results. 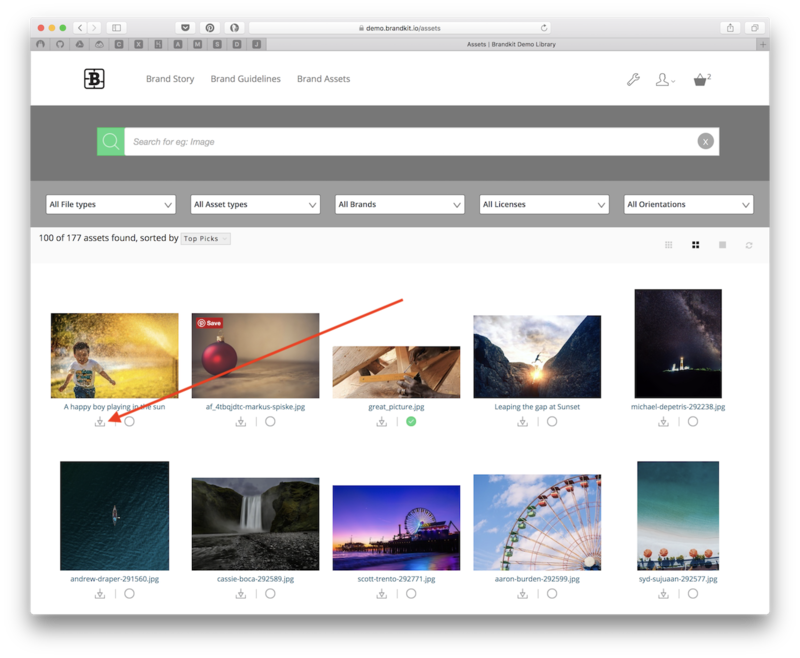 In the Asset search results grid, to download a single asset click the Download Icon underneath the Asset thumbnail. 2. Another way to download 1 asset at a time from the Asset detail page. Click the Asset Title to go trough to the Asset Detail page. 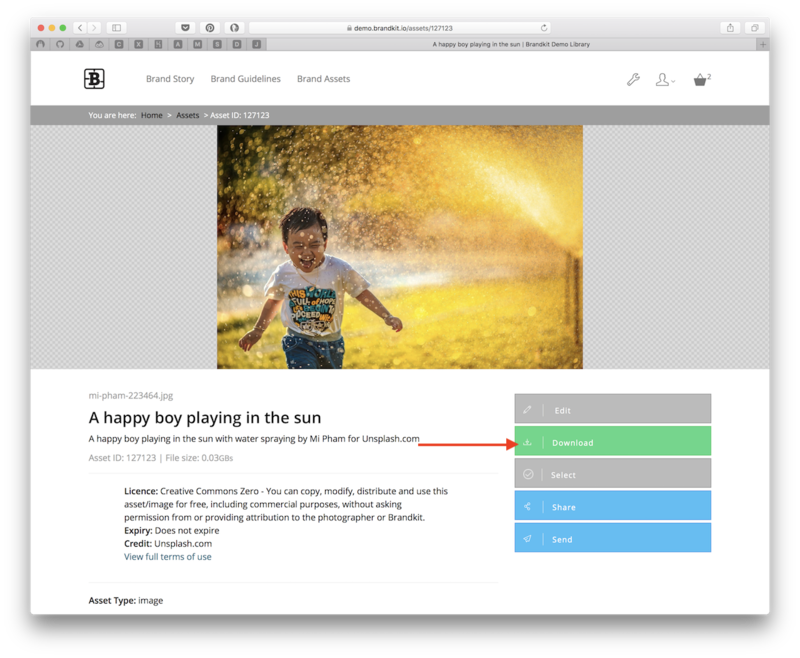 Then in the Actions Panel on the right, click the Download button. 3. Download multiple Assets at a time from the Basket. 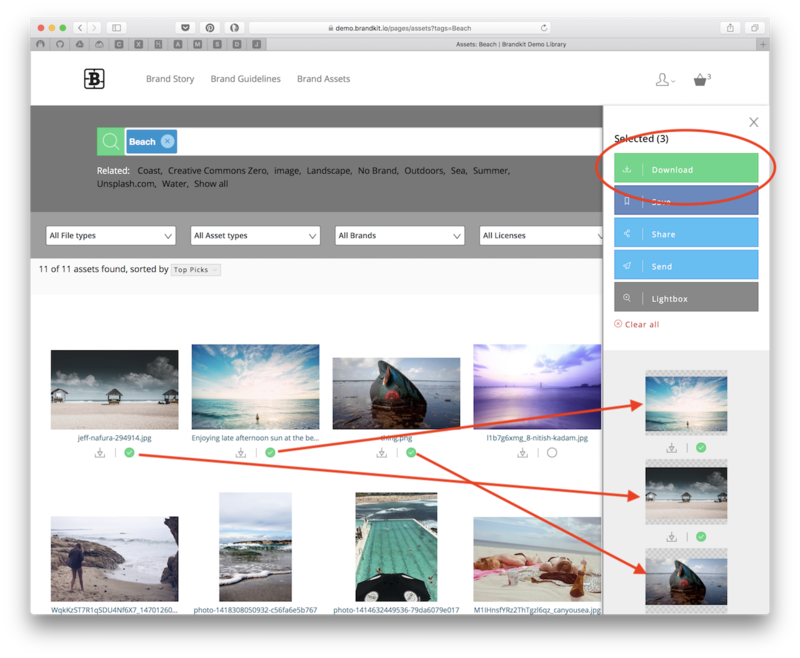 In the Asset search results grid, Select Assets by clicking the Select Icon. The Basket Panel will slide open and reveal your current selection. You can continue to Search and select more Assets, until you are happy your selection is complete. Then, in the Basket Panel, click the Download All button to download. 5. When downloading multiple Assets, Brandkit will zip all the files up into a single zip file. This may take some time, and will display an animated loading Gif while this is processing. You will have to wait for the zipping to be completed (after which the Download button will be displayed). You should NOT navigate away from this page while this is happening. 6. However, If you don't want to wait, you can click the link (below the loading animation), to have Brandkit email you a link to download the zip file once the processing is complete. If you choose this option, you can navigate away from this page and continue your day. You'll get an email when the Zipping has completed. Just click the Download button/link in the Email to start the download to your computer.